These are amazing – and fast to whip up. I found the recipe at MoneySavingMom.com – and made it almost verbatim, but I did it ALL in the Food Processor – which makes this amazingly easy. 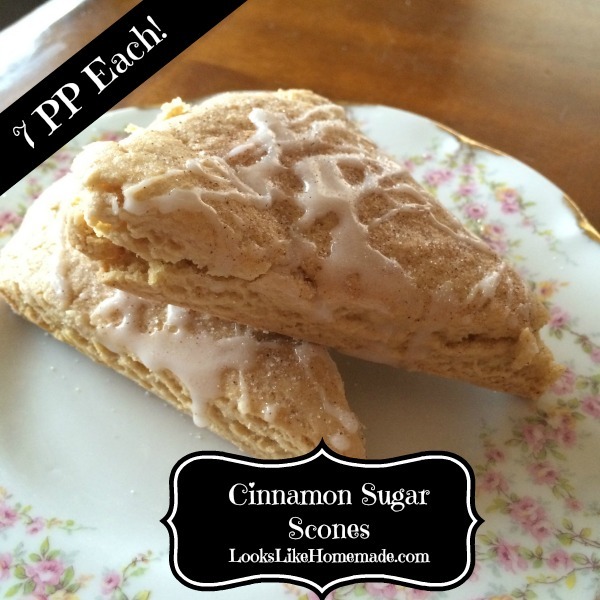 The dough itself is only sweetened with Honey – but they are topped with cinnamon sugar and a powdered sugar glaze – the scone itself without the topping is sweet – you don’t need the extras with the sugar, but there’s so little all together it makes not a ton of difference -and the sweetness on top adds some depth. This is actually a really nice base dough – you could use it to make a variety of scone options – and the white whole wheat flour adds a nuttiness that would make almonds and almond flavoring a great option – I’d make these as written the first time – so you can see the consistency of the dough and the “feel” – then when you edit the recipe – you’ll know if you need more flour or moisture. These work out to about 7 PointsPlus each – which isn’t terrible – considering what a satisfying sweet treat they are. In the bowl of your food processor, add the flour, baking powder, baking soda and salt. Buzz just for a second to combine. In a separate bowl combine the buttermilk, honey and egg yolk, whisk to break up the egg and mix in the honey. I heat my honey just a tiny bit so its easier to measure and mix in. Pulse and pour the liquid in at the same time. Turn out onto floured surface and pat into a circle gently - do not knead! While they bake make the glaze. Sprinkle on more cinnamon sugar and let cool until the glaze is set.